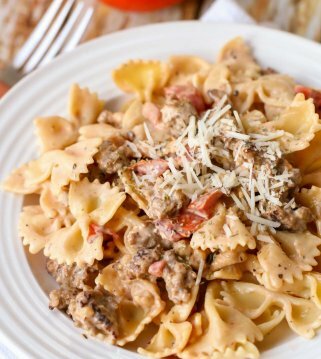 This Easy Beef Stroganoff recipe is simple and flavorful. 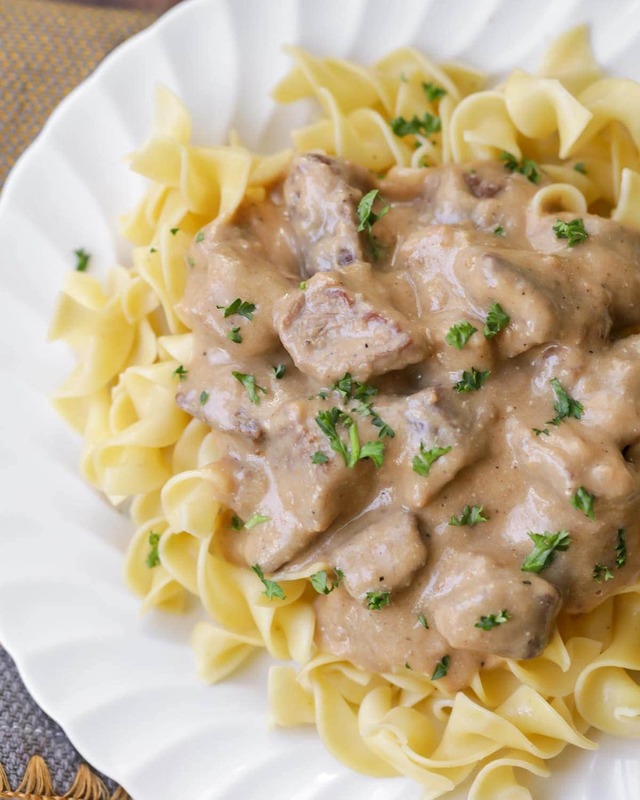 Served with egg noodles, this creamy stroganoff is a classic Sunday dinner recipe Made in the slow cooker and is perfect to enjoy any night of the week. There are several recipes that I remember having ALL.THE.TIME as a kid. One of those happens to be this Beef Stroganoff recipe pictured above. 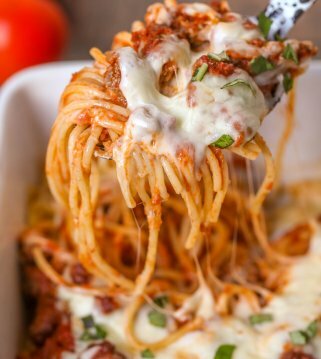 It’s a dinner recipe that we had all the time as a family and was changed up depending on the meat my mom used. Sometimes she used chuck roast, hamburger or steak. It varied every time, but every time we loved it! 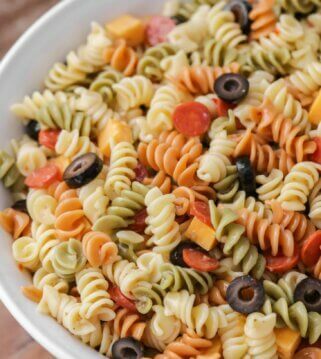 It’s a very kid-friendly recipe that was well accepted since it was basically a yummy sauce, meat and pasta… and we all know that you can’t go wrong with those ingredients. 😉 Am I right?! 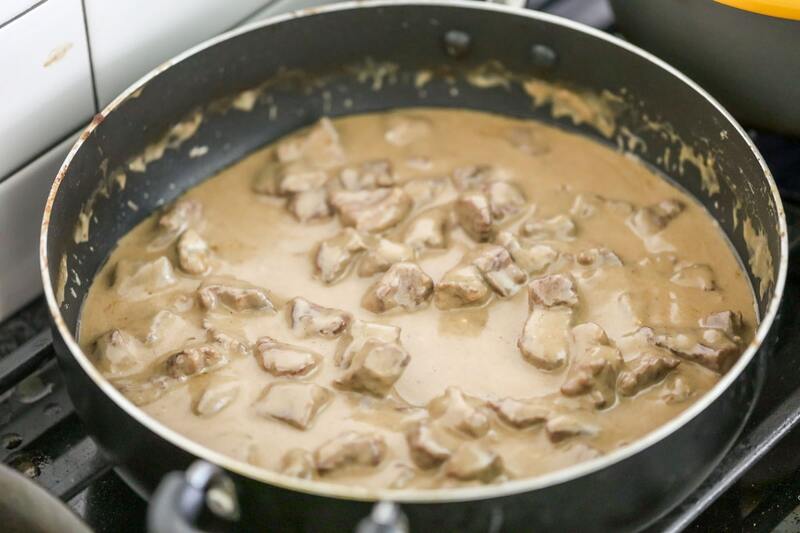 If you’re like me, always looking for simple but tasty recipes the whole family loves, then I suggest trying out this stroganoff recipe. 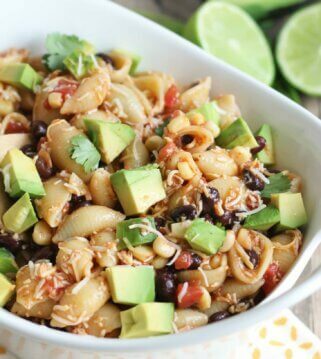 It’s so flavorful and is sure to become a new go-to recipe for the fam! 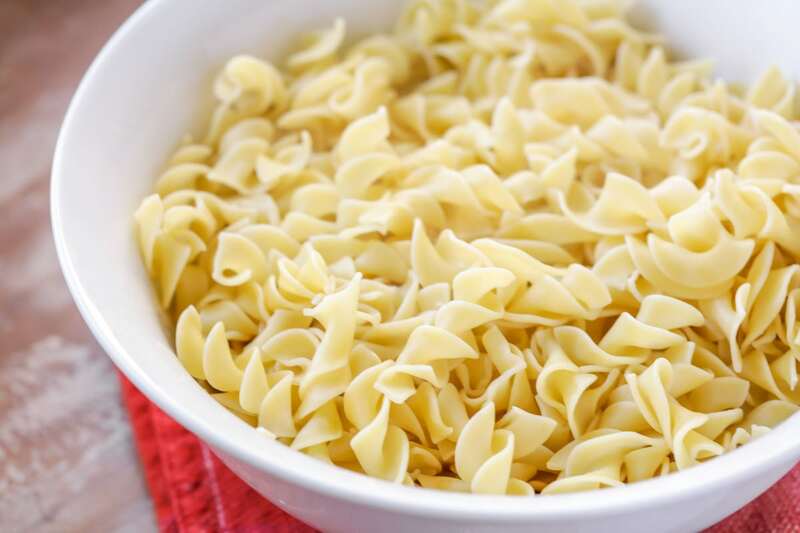 egg noodles (We like to use the egg noodles since those are standard stroganoff noodles, but any work). BROWN MEAT. Add oil to a skillet on medium high heat. Toss meat with flour and salt and pepper to taste. Brown meat in hot oil, about 2 minutes per side. Add meat and beef broth to crock pot and and let cook on LOW for 3-4 hours, stirring occasionally. NOODLES. Cook egg noodles according to package directions. SAUCE. Add sour cream to meat mixture and combine right before serving. Add noodles to mixture and combine or serve gravy meat over a bed of noodles. Garnish with parsley if desired. We love the stroganoff sauce recipe these ingredients make. 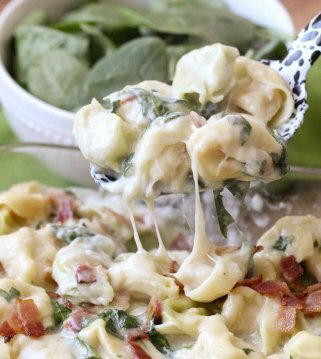 It’s creamy, flavorful and so delicious! Can this stroganoff be made on the stove? Of course – just cook the meat and broth in a large pot for 30 minutes. Add sour cream and cooked noodles right before serving. Why do you add the sour cream last? Sour cream contains natural acids which, when heated, causes the dairy proteins to curdle at a faster rate. You can keep this from happening by adding the sour cream at the end. As mentioned above, we also change out the meat we use for the dish – sometimes it’s hamburger, sometimes it’s roast. We also like to make our Chicken Stroganoff recipe, which is delicious too! Fridge: store in an airtight container in the fridge for 3–4 days. Freezer: store in an airtight freezer safe container for up to 3 months. Reheat: If frozen, then thaw overnight. Reheat in a crockpot, stove top or in the microwave. Be sure to check out all our side dishes to decide what to pair with this dish. 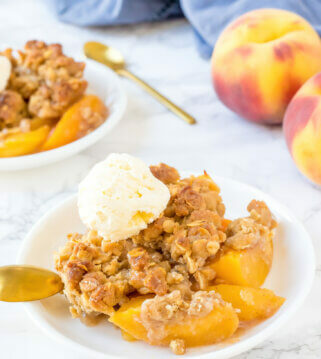 Again – we love that this recipe is so simple and delicious. We’ve tried many versions over the years and this one is our favorite! 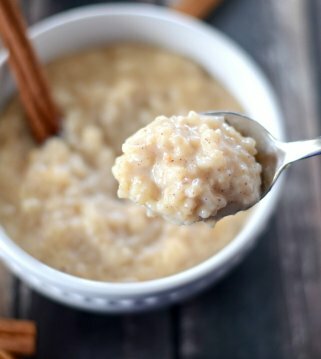 It’s beyond easy and made in the slow cooker too. 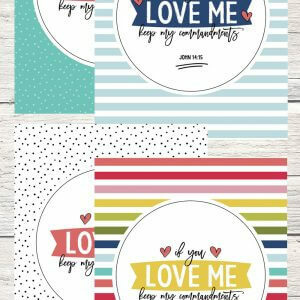 – what’s not to love. 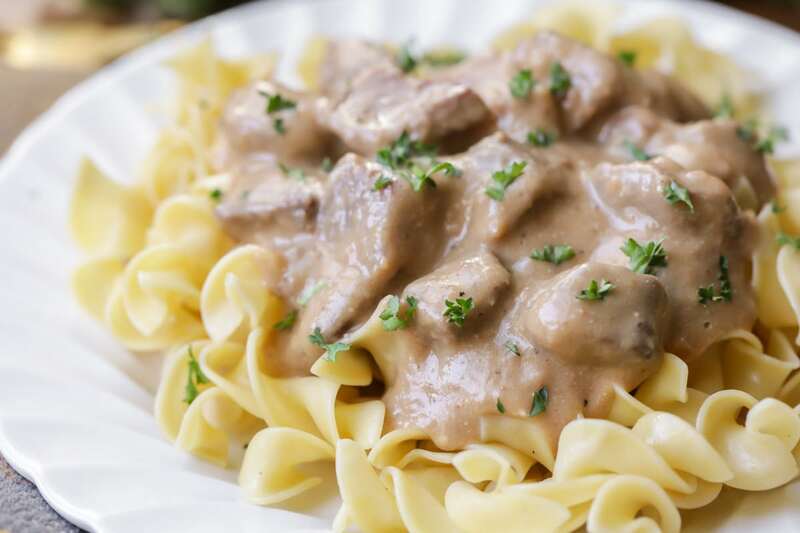 This Easy Beef Stroganoff recipe is simple and flavorful. 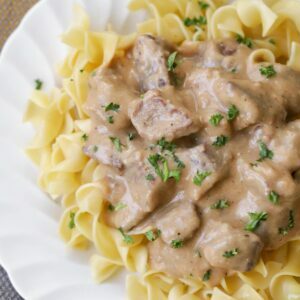 Served with egg noodles, this creamy stroganoff made in the slow cooker is a classic Sunday dinner recipe and is perfect to enjoy any night of the week. Add oil to a skillet on medium high heat. Toss meat with flour and salt and pepper to taste. Brown meat in hot oil, about 2 minutes per side. Add meat and beef broth to crock pot and and let cook on LOW for 4 hours, stirring occasionally. This just might be dinner tonight! Pinned! Hello, this recipe looks delish and I’m already cooking it for dinner tonight. I always hate it when people ask stupid questions on cooking blogs because they didn’t read thoroughly but I didn’t see this….is the crock pot set to low or high. Thanks for the post. 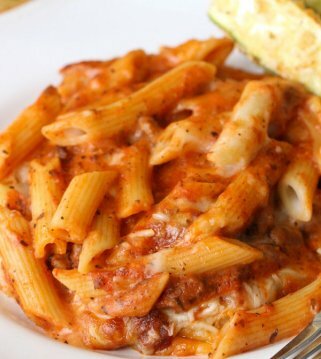 Can’t wait to dig in tonight after my son’s football practice! I’ve been looking for easy meals like this that I can walk away from and finish when we get back from football! Thanks! Oh my gosh, thanks for this. My mom makes beef stroganoff (all the time – it was the first thing she made for my dad when they were dating and he loves it) and I haven’t had it in forever! Neither had I, Dorothy. 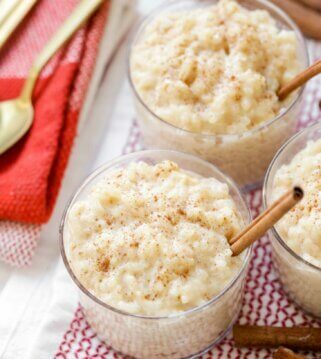 It’s one of those recipes we grew up on but always loved!! I agree!! My family devours this too! Thank you! 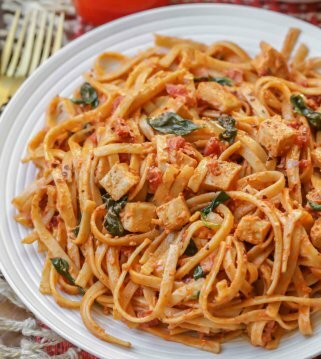 This recipe is on my families 6 week dinner plan rotation. All the kids love it! Its creamy and delicious. When I’m lazy, I just use hamburger meat and it tastes good too! Same on our rotation, too!! My whole family loves it & hamburger meat is great! 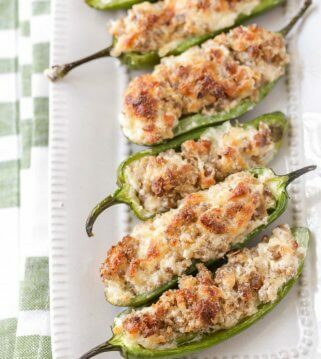 This is one of my all time favorite recipes! I used steak and put the sauce over rice instead of noodles. The sauce is so good I think it’ll work over all sorts of base ingredients. My husband really loved it so I’ll be making it again in the near future. Yes, & I season it with the salt & pepper 🙂 Enjoy! 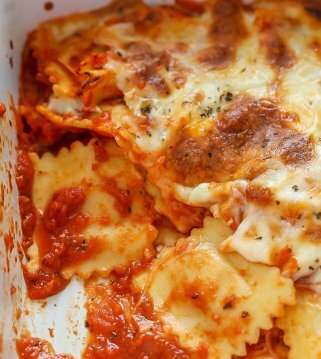 This is one of the best and easiest recipes that I have on file. It’s one that my family has always enjoyed. No worries about not pleasing everyone!